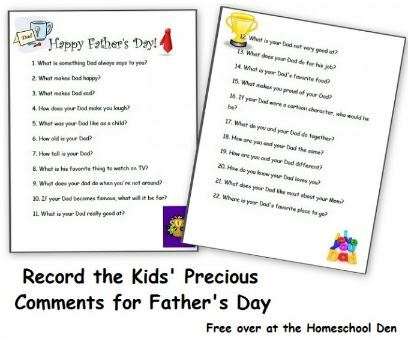 The Homeschool Den is offering a unique free printable set to record the Kids’ Precious Comments for Father’s Day. These would be fun to look back on through the years! Click here for more Father’s Day freebies. We filled these out today—by “we,” I mean our preschoolers and I (Mama)….then they couldn’t wait to give ’em to their Daddy!